Commissioned by the Coca Cola Company and yes, they are the same company that asked a year before, for a timeless Christmas story from Charles Schulz, and received a charming Christmas chestnut called “A Charlie Brown Christmas” that debuted on December 9, 1965. They are classic and family entertainment that has transferred into book form and continues to be enjoyed yearly by young and not so young readers. Why? Well, I have a few thoughts of my own on the reason. A person should always choose a costume which is the direct opposite to her personality. Lucy is a green-faced witch and Charlie Brown with his simple ghost sheet full of large holes has as his reward after a night of house-to-house door bell ringing, a large sack of rocks. Twas ever thus for Charlie; he of the football pulled before the punt, that is an endless prank by Lucy. Linus, as usual gets to the very heart of a holiday. He is waiting for the so called Great Pumpkin to rise out of the “most sincere pumpkin patch” to bring toys to the children. 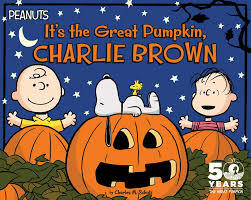 Linus : Each year the Great Pumpkin rises out of the pumpkin patch that he thinks is the most sincere. He’s gotta pick this one. He’s got to. I don’t see how a pumpkin patch could be more sincere than this one. You can look around and there’s not a sign of hypocrisy. Nothing but sincerity as far as the eye can see. He and his stalwart, but ultimately wavering companion, Sally, gather in the pumpkin patch to await the Great Pumpkin. Will he or won’t he appear? Somehow, this year, this season, young readers need to hear the message of Linus loud and long in Charles Schulz’s It’s the Great Pumpkin, Charlie Brown. Linus doesn’t let cynicism, disbelief and doubt shake his belief and hope in the arrival of the Great Pumpkin. Even when seeming reality stares him in the face and sheer disappointment knocks on his door in the outrage of Sally who feel she has been done out of tricks and treats, Linus remains resilient, patient and …. ever hopeful, even when things don’t turn out as he’d hoped. Linus: You’ve heard of the fury of a woman scorned? Charlie: Yeah. I guess I have. Linus: Well, that’s nothing compared to a woman who has been cheated out of tricks and treats. Let’s face it, waiting is hard work on a chilly autumn night in a pumpkin patch, or anywhere else. And, by George, when we wait, we want the payoff at the end. BUT, what happens when the payoff is delayed when we expect it? What if it is delayed or denied. Do we lose faith and hope? Linus is a lesson in faith in a less than faith-filled world that demands the even steven payoff each and every time we wait for what we want. He doesn’t give up and he doesn’t give in, even as he finds himself berated by an angry Sally, and finally found alone, then guided back to his bed by his ever pragmatic and practical sister, Lucy. Linus: Just wait till next year! I’ll find the most sincere pumpkin patch, and I’ll sit in that pumpkin patch until the Great Pumpkin appears. There are three things I’ve learned not to discuss with people: religion, politics and the Great Pumpkin. But… never lose faith in the unseen, because it is often what is the MOST real!